I made it out on a beautiful, but very windy, early fall day looking for tog. The story of my season has been "wind". I think I've been out on the bay once when the wind was lower than a steady 15 knots! 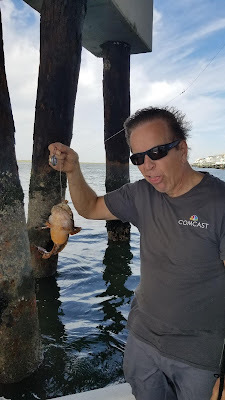 That said, Sea Bass are still prevalent, and some tog are around, the full moon contributed to what turned out to be a very late tide, and with some pressing evening arrangements, I couldn't stay to see if the tog would chew better once the current started running... which is often the case. The oyster toadfish, Opsanus tau, also known as the ugly toad, oyster cracker, oyster catcher, and bar dog, is a fish of the family Batrachoididae. The maximum length of the toadfish is about 15"; the most common recorded length of an oyster toadfish is about 11 1/2". They are generally yellowish with a pattern of brown oblique bars. In 1998, NASA sent the oyster toadfish into space to investigate the effects of microgravity on the development of otolithic organs. The study found little difference between terrestrial development and those in space.